It’s almost year end and as such, it’s normal to look back at what happened in the smartphone industry in a bid to separate the best from the good. Many will agree that 2017 has been great for the smartphone industry. Some amazing phones came out, be it the Samsung Galaxy S8, the Google Pixel 2 XL, the Apple iPhone X or even the OnePlus 5T. However, as mainstream users, it’s obvious you won’t be buying all of these phones just so as to have all of them at your disposal. Of course, if you can afford them, no problem, but for those who are looking to buy only one of the best, you might want to dig deeper than the usual design and display, performance specs, software and camera comparisons. According to a new report, the OnePlus 5T has one major advantage over the rest of the 2017 flagship phones, including the Apple iPhone X, Google Pixel 2 XL and Samsung Galaxy S8. The 5T is an upgraded version of the original OnePlus 5, coming in with a redesigned front panel but it keeps a lot of what is on the back and retains everything on the inside, apart from one camera lens on the dual-lens setup on the back. The OnePlus 5T boasts a 6-inch AMOLED display screen with an 18:9 aspect ratio and full HD+ resolution. This is OnePlus’ attempt to compete with the Infinity Display screen of the Galaxy S8, the near bezel-less Pixel 2 and the bezel-less iPhone X – and it does a pretty decent job. The camera on the back is a dual setup, but the 20MP lens is optimized for low-light performance as opposed to the telephoto unit used in the original 5. All these improvements have without a doubt placed the OnePlus 5T on the limelight, but there’s more to this phone that just the design and camera. Apparently, a review done by Tom’s Guide reveals that the 5T is the best when it comes to the battery department. In addition to shipping with a significantly bigger battery than the competition, the 5T also happens to be the fastest when it comes to charging. The review involved up to 10 flagships from 2017. Other than the already mentioned, others are iPhone 8 and 8 Plus, Pixel 2, Galaxy Note 8, Galaxy S8+, and LG V30. From the tests, the OnePlus 5T emerged the winner, managing to fill up to 59% of the battery in just 30 minutes. 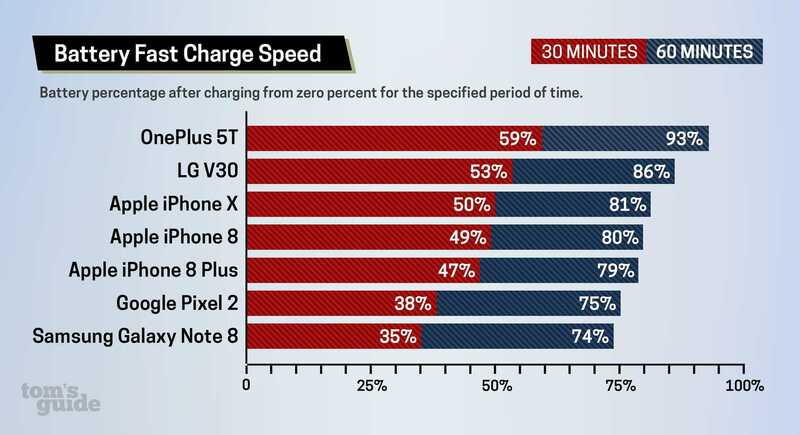 In the same amount of time, the LG V30 managed 53%, iPhone X was at 50% followed closely by iPhone 8 at 49% and iPhone 8 Plus at 47% while the Google Pixel 2, despite having a small battery unit, was at 38% after 30 minutes of charging. The fastest charging Samsung phone is the Galaxy Note 8, which managed to fill 35% of the 3300mAh unit after 30 minutes and 74% after 60 minutes. As you may know already, fast charging on the latest iPhones requires an extra accessory – a 29-watt power adapter accompanied by a USB-C to-Lightning cable, but with Android phones, this feature comes as part of the phone. With this in mind, it gets even slower when charging the iPhones using the standard AC plugs they come with, where the 30 minutes on the iPhone X gives you a mere 17%, iPhone 8 gives you 30% and iPhone 8 Plus gives you 26%. While the OnePlus 5T might be the fastest when it comes to charging, it’s not the best when it comes to retaining this power. Apparently, the Google Pixel 2 XL is, managing a battery life of over 12 hours compared to the 11 hours of the 5T, but of course, this is due to the extra 220mAh on the Pixel 2 XL’s battery. The good side of the story is that even if the battery runs out fast, a short period of charging will give you enough juice for the rest of the day. What makes OnePlus 5T unique is that unlike most of the tested phones, it doesn’t use Qualcomm’s Quick Charge technology, rather, it uses its own Dash Charge technology. This is proving to be the major difference between the two sets of phones, but there’s another one – the price. Apart from Apple, the rest of the Android phones in the list use just about the same hardware specs, although OnePlus 5T takes this aspect to the next level with up to 8GB RAM. Despite all this power and quality, the 5T is the cheapest handset on the list, coming in at $500 for the base model and $560 for the high-end variant. This is nothing close to the premium price tags slammed on the Samsungs, LGs and Apples of this world, yet from the tests, it’s evident that the 5T is way ahead of the pack.